Located in Basse-Terre Island more precisely in Deshaies Township, Jardin Botanique de Deshaies has been created in April 2001. Back in the days, the property used to belong to the famous French humorist Coluche. With up to 120 000 visitors per year, this well designed Floral and Wildlife park stretches on 7 hectares with well maintained pathways. The designers, landscape gardeners and nature lovers worked hard to make an outstanding park that worth a visit. Jardin Botanique de Deshaies has an extensive variety of tropical flowers and plants from all over the world. There are over 700 beautiful species on display. 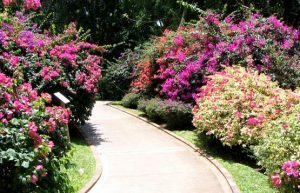 Some of the flowers include: Bougainvillea, Heliconia, Hibiscus, Jade vine, different species of multicoloured Orchids, Red Ginger lily or Red Rubber plants to name a few. For instance, Mimosa pudica also called sensitive plant or touch-me-not plant is an amazing plant that will catch your attention. Indeed, this plant is well-known for closing/folding its leaves inwards when touched or shaken. Another interesting spot is the arboretum which is a dedicated space for various species of trees. Some of them are the Silk-cotton tree, the Baobab or the Talipot palm native to Sri-Lanka. The Talipot palm in the garden is around thirty years old. In terms of organisation, there are various sections in the garden. The Cactus, Herbal/Medicinal and Tropical sections are the main ones. 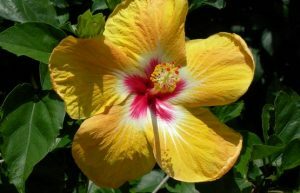 For more information, each plant has its own label with the scientific as well as common name in French. Right at the entrance of Jardin Botanique de Deshaies, there is a large koi pond. You can purchase some food to feed the fishes. Then, there is an Aviary featuring 5 species of birds. Here they are: zebra finch, java sparrow, pacific parrotlet, laughing dove and blind golden pheasant. The Macaws from Brazil and Lorikeets are others flying animals that you can hand feed. 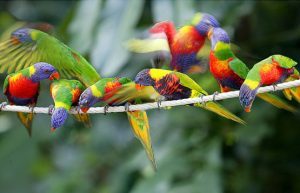 They have colourful and gorgeous feathers. In Guadeloupe Archipelago, there are 3 species of Hummingbirds that you will be able to see in the garden feeding on Heliconia. Here are the Hummingbirds’ names: the purple-throated carib, the green-throated carib and the Antillean crested hummingbird. The Bananaquit is another species of bird quite present in the Caribbean, that you will discover in Jardin Botanique de Deshaies too. 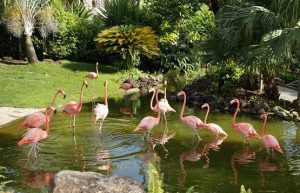 You will also be delighted to see 14 flamingoes from Cuba in a secure pool. Finally, baby goats are just waiting for you to pet them so don’t hesitate. Apart from the luxuriant flora and diversified fauna, you will also be able to have a great culinary experience when visiting Jardin Botanique de Deshaies. The panoramic restaurant has over 100 seats and serves delicious French-Creole food. The take away Snack Bar Le manguier is another option. At the end of your visit, you might want to head to the souvenir shop where there is a wide range of handcrafted items. Jardin Botanique de Deshaies is children-friendly, for a matter of fact there is a play area on the way out. The park is also disability-friendly. Jardin Botanique de Deshaies is set up in an idyllic environment with few water sources such as ponds and waterfalls. If you want insightful information about the fauna and flora on-site, there are multiple guided tours, workshops or conferences throughout the year. To sum up, Jardin Botanique de Deshaies is open Monday to Sunday from 9am to 4.30pm. I love visiting gardens when I travel. It’s such a unique way to see the local flora and fauna! Thanks for sharing. Yes that’s true, I love it too. Thanks for stopping by. Omg, it looks soooo pretty! Yes it is!!! Thank you for stopping by. Yes I enjoy it as well, it’s so refreshing. Thank you for stopping by.